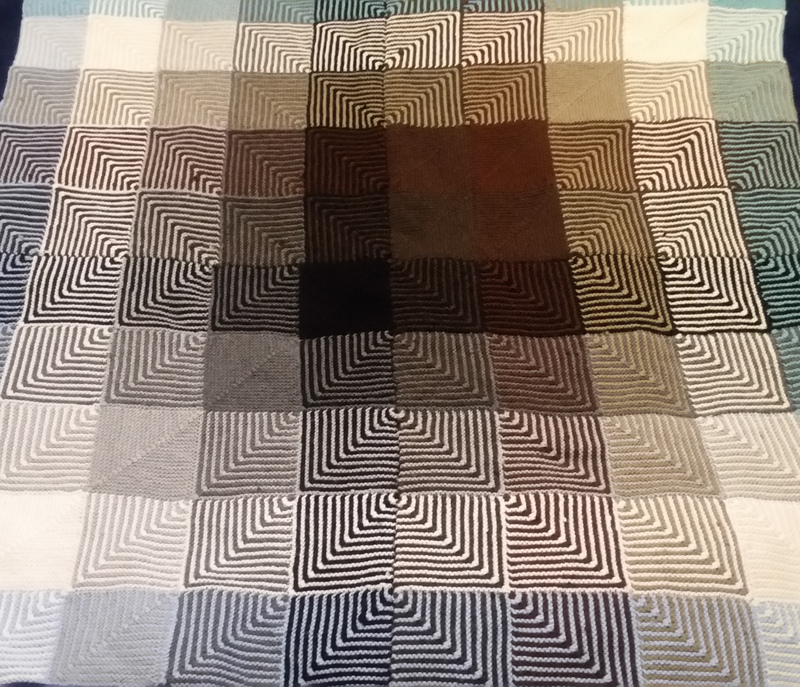 Knitted Op Art – I didn’t see it as I was knitting, but the photo is definitely playing tricks with my eyes. My posts have been rather few and far between, but this one will explain alot. I made this as a thank you/housewarming gift to people who helped me a great deal when I moved to California. I kept pushing myself to have it done – first by Halloween (which didn’t happen), then by Thanksgiving (didn’t happen), and then by Christmas (success!). I am calling this project 100’s because it is a story of hundreds. The pattern is Hue Shift Afghan by Knitpicks, and yarn is Brava Sport. It is a hundred mitered squares, which took me 100 days to knit. It could have taken more or less, but it gets old knitting mitered squares, and so to keep the momentum going on this, I set a goal of completing an average of 1 square per day. (Meaning that some days I did multiples to make up for days I wasn’t at home to get knitting done.) Proud to say I stuck to that goal! A note about mitered square projects – you will save yourself bunches of tedium if you pick up and knit stitches onto previously completed squares rather than making all the squares separately and then sewing them together later. I speak from experience! This particular pattern is written to use picked up stitches, in case you’re wondering. The border is hundreds also – 250 stitches per row, each side, to be exact. Knitting the border plus doing all the finishing (lots of weaving in of ends!) took me another 100 days I would say. Lots of powers of 10, hence the name. The finished piece – photographed as flat as possible. It is hard to not get perspective going when photographing something so big, but I am happy I captured the optical effect. As is the case with most big projects, I was very tired of it and happy to be done by the end. That said, I am very happy with it, and more importantly, the recipients are happy with it. 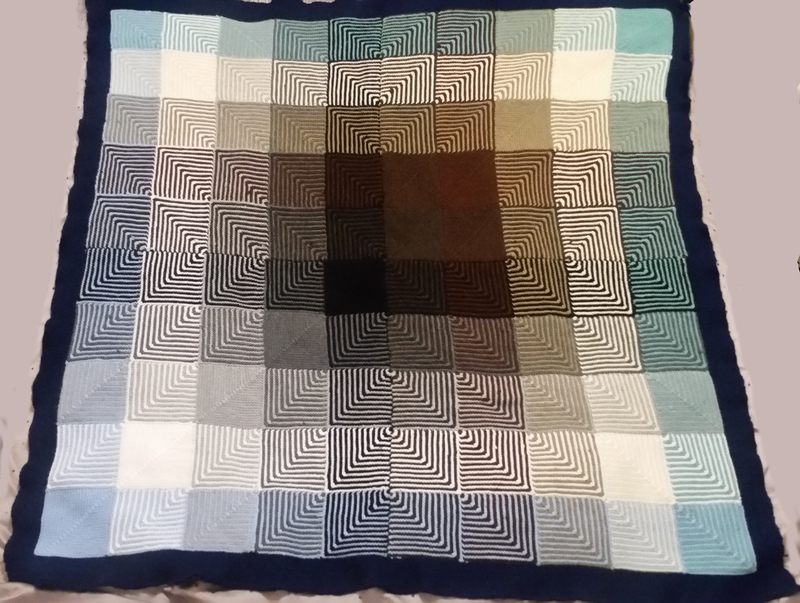 It is a fun project, and you can do so much play with color. This has the wow factor! Very chic and modern. I bet it would surprise a lot of people who think knitting is a bit old-fashioned. Super gift! Thank you so much! You know, just doing my part to represent. hehe 🙂 I will say, as a side note, this is not a gift for just anyone – it’s alot of work, so if anyone wants to make it as a gift, make sure your recipient is worthy! Oh yes, I definitely understood the amount of time and effort that went into it. Also, I guess any errors would show up big time, so concentration must have been required too! That is really cool! And what a lot of work. The chevron effect and the color changes make this fabulous! Lucky recipient!